I have a new favorite time-wasting website: Shorpy. It is "a vintage photography blog featuring thousands of high-definition images from the 1850s to 1950s." The pictures are amazing. They are, for the most part, scanned high-def images from the Library of Congress Research Archives. It is a great way to spend some time in history. I have added a link to the site on my sidebar of favorites. To continue the fruit theme for the week - Emily brought me some fresh blueberries, picked from the bushes in her yard. They are small blueberries, almost like huckleberries. When I saw their size, my first thought was "I have to bake something with these!" So, I did. Blueberry-lemon muffins from one of my Moosewood Restaurant cookbooks. Since Benjamin is still away and the camera is still with him, there aren't any pictures. 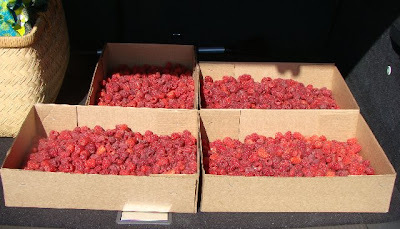 You will just have to imagine them, and enjoy this picture of the 20 some pounds of raspberries my parents picked today. I'm jealous. Raspberries don't do so well down here. Ah well. Blueberries are pretty good too. This picture, by the way, is one of my dad's, from our trip to Japan when I was 6. 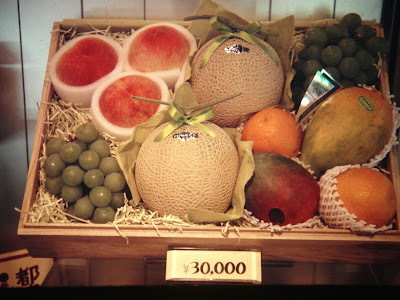 I have no idea what 30,000 yen is in today's money, but the fruit sure is dressed pretty. 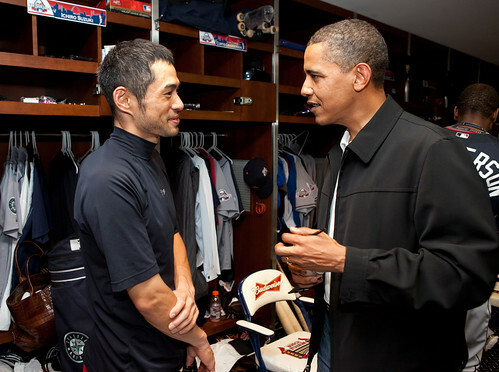 Here is a great picture from the White House photo stream on Flikr. ...I saved a turtle from certain squashing and bought a bag of fresh peaches and still made it to work on time. The turtle was wandering in the middle of the road at the bottom of our hill. I stopped, jumped out of the car, and relocated it to the grassy side of the road. I don't know where it came from or where it was going, but the grass is a much better place for it than the pavement. 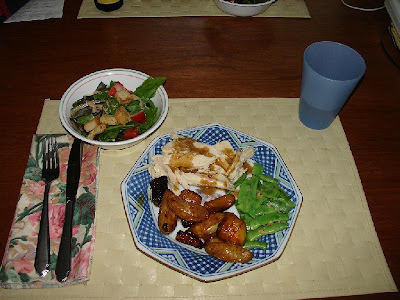 Sunday night we had a great dinner: roast chicken from Falling Sky Farm, green beans with garlic, roasted potatoes and carrots, and salad. All of it from local farms. The chicken was moist and flavorful, the beans and potatoes excellent. Last night we used the left-over chicken to make soft tacos with tomato-corn salsa. Again, excellent. I made the corn tortillas myself; it isn't hard, but I always forget that I need to do it until almost everything else is ready. Which means lots of rushed tortilla rolling and masa flour all over the counters. But the result was worth the mess. On Saturday, we spent 5 hours at the dealership, waiting through computer crashes and getting stuck in the virtual line for financing approval. But it was worth it, when I drove off the lot in my new car! Strictly speaking, it isn't new - it is a 2007 Honda Civic EX Coupe with 28,000 miles on it - but it is new to me, and 12 years newer than our other car. And it has air conditioning! Ah, sweet, sweet air conditioning. OK. Some pictures from last weekend, before we start this weekend. 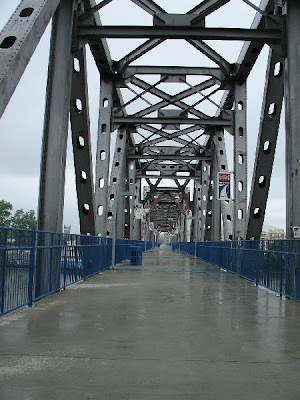 This first one is the Big Dam Bridge - where we started our ride. I was glad to stop for a minute after the climb up that hill! 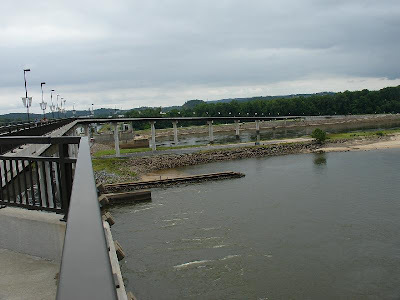 The path goes over the dam on the Arkansas River. Pretty nifty. 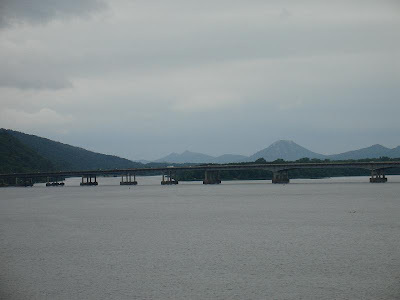 This is a picture of the view, looking at the I-430 bridge and Pinnacle Mountain in the background. If you squint, you can almost imagine you are crossing Lake Washington. Almost. At the other end of the bike ride (or the middle) we crossed the pedestrian/bike bridge over the river in the middle of Little Rock. It is on an old railroad bridge. The view would have been quite good, it it hadn't started pouring rain as we got there. This was as dry as I would be, since we set off into the rain once again shortly after. The rain wasn't bad though - it certainly kept us from overheating. By popular demand, here are a couple more Miikka pictures. He likes to play tug-of-war, but he doesn't really get the idea. He prefers to hang on to the rope (or towel or pant leg) with a death grip and allow himself to be tugged around, or rolled around, or used to dust the floor. 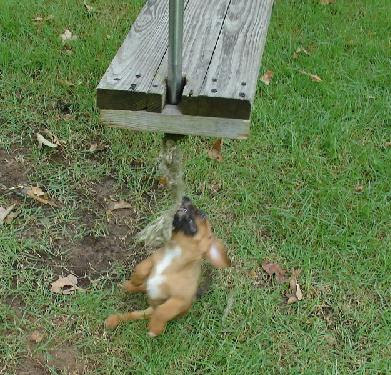 In this case, he discovered the rope on the bottom of the swing, and was allowing himself to dangle from it. Funny puppy! And here he is all pooped after his exertions, or trouble-making. 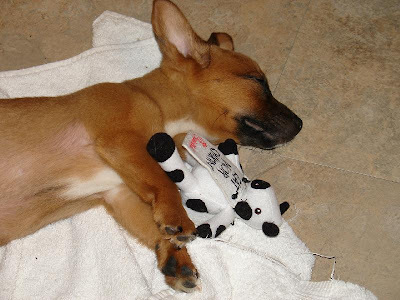 That toy is a Chik-fil-a cow that I got at the baseball game on Friday. The little girl who was with us didn't want it, so I brought it home to Miikka. I know I haven't posted much lately, but I've been busy...and yet haven't had much to write about. Moving is like that. I doubt you really want to read about moving boxes around, going to a new grocery store, and cleaning up after puppy messes. This past weekend, however, we were busy doing fun things. On Friday, we took a few test drives of cars we might be interested in. 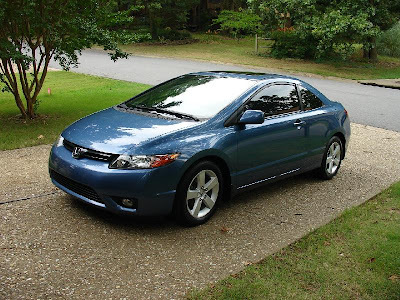 I really liked the 2007 Honda Civic coupe - nice and zippy, and it has air conditioning! (Of course, any car we get will have A/C, but don't underestimate its appeal to someone who doesn't have it). In the evening, we met up with some friends at the Arkansas Travelers baseball game. It is the local minor league team, and because it was the 4th of July weekend, there were fireworks after the game. I don't have any pictures because I forgot the camera, but you can always go back to last year - we have started to make minor league baseball and fireworks a tradition. The fireworks are always good, the game is usually fun, and it is a great way to celebrate. 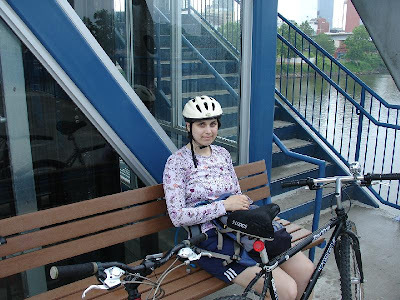 Yesterday we went on a 16.5 mile bike ride over the Big Dam Bridge and along the Arkansas River Trail. I do have pictures of that, but they are still on the camera. Later this week. About halfway through the ride, it started to pour. At first we thought about sitting it out, but when the rain didn't go away, we decided to keep going. I've never been bike riding in the rain like that - good thing it was warmish, because we were soaked. And of course, we played with Miikka. He loves running around the yard, attacking sticks and your socks.